We created KEW Green Gardens to help you make the space around your house as inviting, well designed and livable as the space inside your home. When your landscape reflects your style you'll find that you've increased your family's living area while enhancing their lifestyle. Your backyard becomes a tranquil garden. The landscaping in front of your home becomes your statement about the integration of architecture and nature. And good design extends a warm welcome to friends and family. Central Texas features a rich confluence of geography and botanical diversity. It's the meeting point of the gulf plains, the rolling Texas Hill Country and the rich soil of east Texas farm land. There are many native species that thrive in our area and they are well adapted to our warm and frequently dry climate. KEW Green Gardens is committed to integrating the bounty of local plants, trees and flowers to create easy-to-manage designs that will charm you with their beauty and simplicity. Good landscape design calls for a wise mixture of technical knowledge, an informed aesthetic and, a good eye. Kirsten's love of outdoor living informs every project. She is passionate about providing movement in landscape, believing that features which convert breezes into kinetic movement provide a welcome psychological lift. Kirsten's defining strength is the enthusiasm she brings to each project, leading one Austin couple to call her their "yard coach". 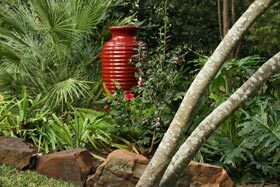 With years of landscaping experience she is practiced at bringing together the right designs, the right craftspeople and the right materials to create your unique outdoor environment. Kirsten is Green Garden Certified. Learn more here. Kirsten took the time to listen to my dreams and understand how to implement them into my landscape. She was able to simplify a very scattered, haphazard series of plantings and bring them together in a unified plan. And all of this using existing materials and native plants that will be easier to maintain.